Back in the early 1980s, I bought rubber model of a Golden Toad. The sign on the bin of toy toads said that it was an endangered species -- one that I had never heard of until I saw that display. It was only found in one small high-altitude area of Costa Rica. But that wasn't the reason I bought it. I just thought it would look pretty in a flower pot. 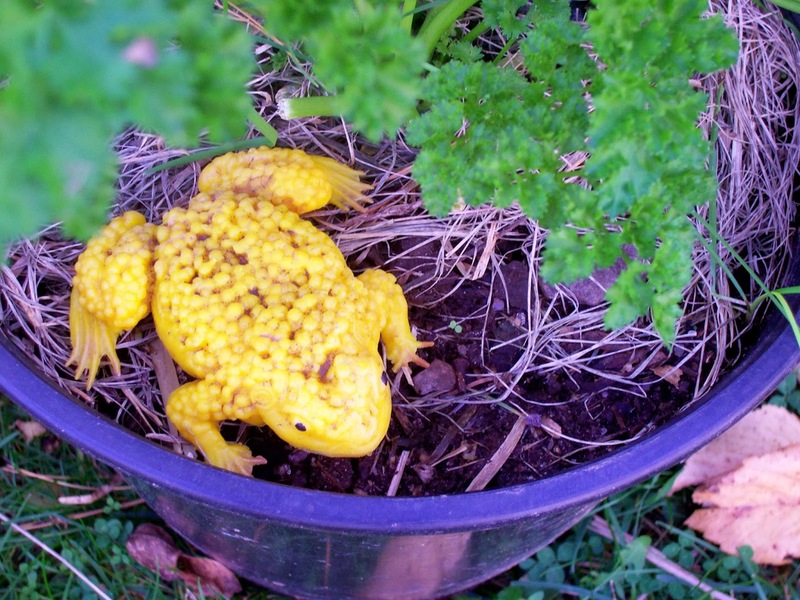 Over the years, my model toad "lived" in pots of petunias, parsley, marigolds, and many other plants, both in the garden and on the windowsill. It got a bit faded over the years, and is now more of a yellow toad, but it still graces my garden. This past summer, my 4-year-old grandson noticed it and asked me where I got the "yellow frog." I told him it was a model of a real species of toad, and went on the Internet to find some photos. Sadly, we learned that the Golden Toad is now extinct, and has been since 1989. Several theories for the extinction have been advanced, but the main culprit seems to have been global warming. In the spring of 1987, an American biologist who had come to the cloud forest specifically to study the toads counted fifteen hundred of them in temporary breeding pools. That spring was unusually warm and dry and most of the pools evaporated before the tadpoles in them had time to mature. The following year, only one male was seen at what previously had been the major breeding site. Seven males and two females were seen at a second site a few miles away. The year after, on May 15, 1989, the last sighting of only one male occurred. No golden toad has been seen since then. When I compare my model with a photo of a real Golden Toad, I can see it really wasn't very accurate. Most likely, the factory used the same mold as for an American Toad, only with golden plastic. The real thing was smoother and not so squat. Still, the little rubber toad serves as a reminder -- a memorial if you will -- to a beautiful species that is forever gone. To some people, the loss of a toad in a faraway rain forest might not seem very important in the grand scheme of things. But scientists tell us that thousands more species are endangered, many go extinct each year. Unlike Noah, we seem to be unable to gather all of God's creatures onto our flimsy Ark. And, as the T-shirt says, "Extinction is forever." The loss of any species greatly diminishes our world. Oh my. This is so sad. I am amazed that a species could die off in the span of just two years. I DO believe each creature is important in the overall scheme of things, not just because it has some use, but just because it was created. I am glad you have this model to remember it by. Laura: an El Nino caused the very dry weather that year that evaporated all their breeding ponds and killed off the tadpoles. There are a lot of species like that, very sensitive to changes. I find myself wondering how many other species we have lost before we even got an a chance to learn about them. Very sad.